For the past couple of years I've been completing little adventures that I'd had in my head for some time. One would think that this mental list would be growing smaller. However, I keep managing to come up with new ideas and after being introduced to packrafting last year, a whole new category of routes in Scotland has been taking shape in my plans. A descent of the River Spey has been right up there in the priority list so when the guys at BackCountryBiking were putting together a trip I was all over it like a rash. Part of my enthusiasm is a reluctance I have to take my raft down any sort of rough water on my own - at least until I've added a few skills. As we'd also be getting some skills coaching over the course of the three days, this just added to my desire to be there. 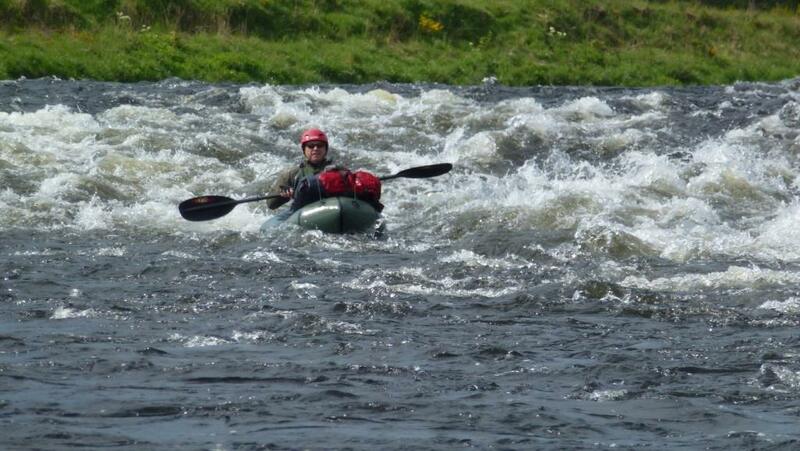 Early Friday morning saw me heading up the A9 in the van with the raft and camping gear all ready to roll. Weather forecasts had been somewhat mixed so my final selection of clothing was a bit up in the air. However, it was looking increasingly bright and warm as I approached Aviemore so I was hopeful. We all met up outside the Bridge Inn in Aviemore and after a quick gear check threw everything into my van before heading off to collect Iona from home, taking the opportunity to stock up on some food from Tescos en route. Rob had already made the decision to start at Cromdale. That would bypass one of the slower, more boring sections of river and would mean that we could make the sea in a leisurely three days. Setting up the rafts, it was clear that there were a few approaches to how much gear was ideal. I'd managed to squeeze everything into one 50 litre rucksack whereas Sanny seemed to have the equivalent of a small mule train with him. One thing we'd all noticed was that the water, even this far upriver, was fairly belting past and we could feel that as soon as we entered the water. At this point, all us learners were a bit jittery on anything resembling rough water. It was taking a little while to get used to the feel of the raft moving over waves and Rob was helping us to assess potential hazards like rocks in the water. There was a definite feeling of being under way though and it was great to see the Cairngorms gradually receding as a sign of our progress. Our first stop was to be at Ballindalloch. There's not much there - a bridge, a few houses and a little informal campsite set up for the Speyside Way walkers that we took full advantage of. Gary decided he'd camp a little away from the rest of us in order to avoid snoring. His plans were thwarted when two walkers arrived and set up their tents close on either side of his! Meanwhile, I'd opted for just the tarp and bivvy bag so felt a little "exposed" being in such a public spot right next to a car park. It was about this point that Sanny proceeded to cover the little picnic table with the contents of his extensive luggage collection as it turned out to be almost all food and drink. Personally, I was happy with my little dehydrated meal. Honest I was. Still, at least I had a little hipflask to relax with and we enjoyed the local cabaret which seemed to involve some sort of synchronised car parking. A fairly early night saw me wake up around 5.00 to a thick mist. Still, it appeared to be midge free despite the tree cover and I was able to roll down the bivvy bag and sleeping bag to enjoy the new day arriving. Before long we were back on the water and were soon facing one of the Speys more fun spots - the Washing Machine. Rob was careful to explain what was required to us and then set off downstream, soon disappearing over the watery horizon. Taking that as a signal we each set off, giving each other sufficient time to clear the rapids. I was a bit tentative, trying to stick to a less wild looking right-hand line. This proved to be a bit rocky though. Once we were all clear there was a bit of discussion and we opted to try it again. That meant dragging the raft upstream over some slippy rocks before launching back in. By the third attempt I reckon I had it nailed! Some other tricky rapids were to follow before we found a good spot for a bit of lunch and relaxed in the pleasant sunshine. Gradually, we were all starting to enjoy the faster water and gaining confidence when faced with obstacles. Rob explains the route options. Sanny gives him the thumbs up. 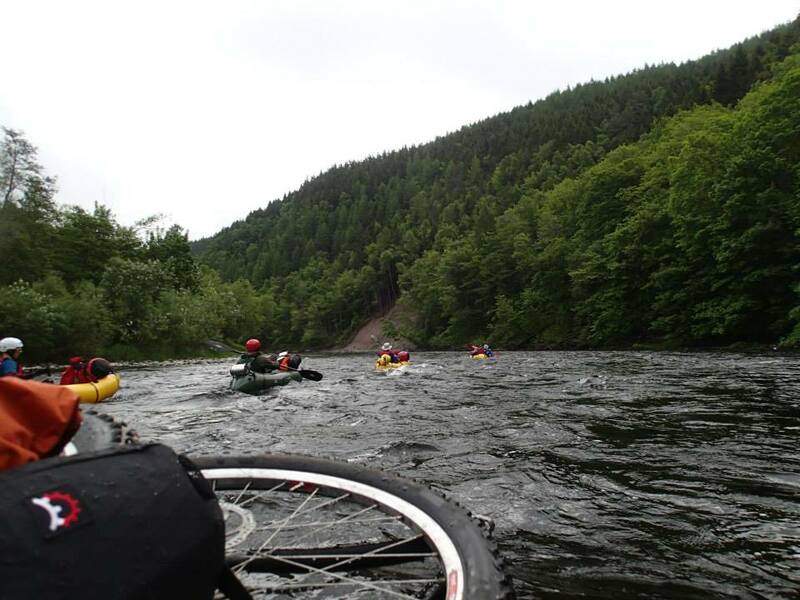 After lunch we headed downstream to meet up with Andy who'd parked down at Spey Bay and cycled up to Carron Bridge. 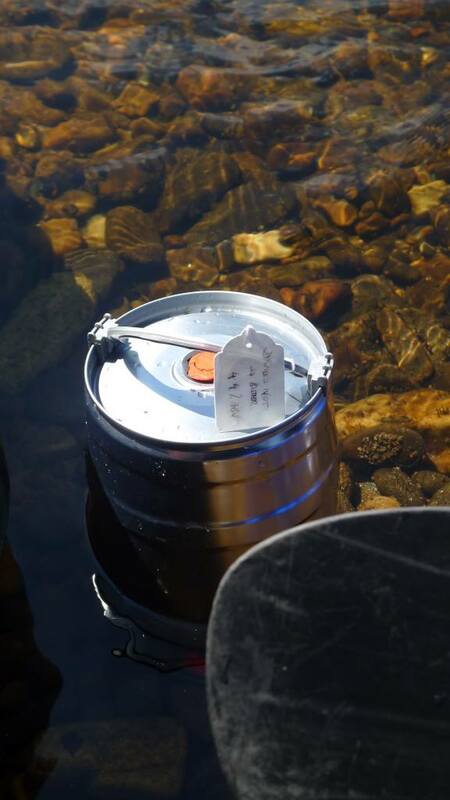 There we also discovered a little present from David of Spey Valley Brewery - a mini-cask of Davids Not So Bitter. Carefully leaving the tricky opening of this to Andy meant that it was him that got sprayed with beer and not me and while it would have been best left to settle for a while it still went down a treat. Another few miles under our belt took us to Aberlour where we enjoyed an ice cream and cold drink. Before long though,we'd arrived at Craigellachie, our stop for the second night in another Speyside Way campsite and a chance to sample more of Davids lovely ale. Rather than cook, tonight we all headed for the Craigellachie Hotel and, despite Andy winding up the barmaid, had some lovely food and a couple of beers before setting off for the famous Fiddichside Inn for a couple more - topped up with a dram or two of course. By the time we made it back to the campsite I was well ready for bed and didn't really care that my wee bivvy and tarp looked a bit incongruous. It was warm, comfy and midge-free so I was a very happy paddler. Day 3 started dry and sunny and after breakfast we all set off down to the river to re-inflate the boats and pack everything back on. By now, it was becoming second nature and I'd worked out the best clothing options, what to keep in pockets and what to stash in the rucksack. It was mostly a more relaxed day of paddling despite the faster water. One particular bend did cause a little concern though as the strong current would have led us straight into some fallen trees. A bit of discretion saw us walk past this bit giving me a chance to make full use of my self-made "water-boots". I've been looking around to find a good solution to footwear for packrafting. Neoprene shoes such as used for drysuits look to be OK but the grip can be pretty dire (Gary would attest to this) and they're not robust or supportive enough for backpacking. 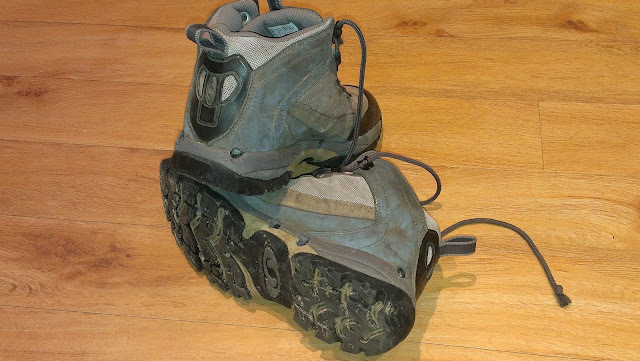 Ordinary hiking boots would fill up with water and then be both uncomfortable and wet. I'd therefore taken a 10mm drill to an old pair of Salomon boots, creating 10 drain holes in each. Pairing these with Sealskinz socks would, I reckon, be a good (and cheap) option. As it turned out, they worked pretty well. The biggest issue was trying to let as much water as possible drain out before putting my feet back into the raft. I'll still be looking for alternatives but for cheap they win. Cheap. Functional. Maybe not pretty. The landscape was changing much quicker now, with little to see beyond the immediate river banks and once we passed Fochabers it was getting increasingly difficult to determine which of the many braided water channels would be best. Still, we all made it through easily enough until we started to hit an increasingly stiff headwind coming off the Moray Firth. That made the last few hundred metres a struggle and also meant that any plans to head out into the surf were firmly put on the shelf. When we got to the point that the rafts were bobbing up that was, to me at least, proof enough we'd arrived at the sea. Packing the rafts away for the last time on this trip I felt a wonderful sense of achievement as well as not a little tiredness. I felt I'd learned so much on the trip and it was much more rewarding than a simple skills weekend would have been as we still made a journey. From here, I'm keen to keep up some momentum by getting out on more moving water and getting that confidence up. Routes in the far North West beckon. I'd like to say a massive thanks to Rob and Andy of BackCountryBiking. 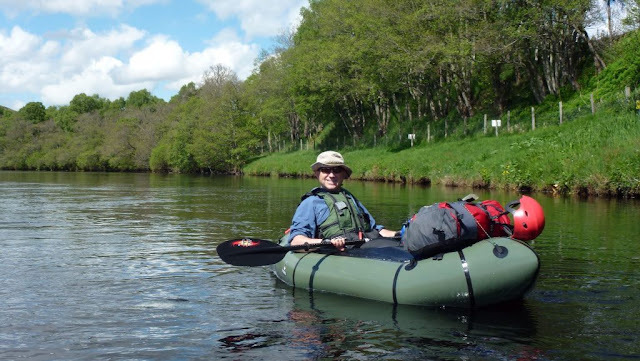 Their enthusiasm, encouragement and companionship made the whole trip a success and they deserve more plaudits as packrafting in Scotland becomes more mainstream. 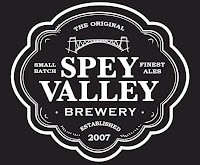 I'd also like to thank David at Spey Valley Brewery. I know he was gutted at not being able to join us on the trip but his gift was well received and it's almost worth a trip to the area just to try his superb beers. I've previously mentioned my role as a volunteer path surveyor for the Scottish Rights of Way Society (Scotways). In my enthusiasm to be helping out I asked for something a bit more local that I could hit in an easy day from home. I was assigned a path marked on OS Landranger 71 heading south-east from the village of Muirkirk. I followed my standard of searching google and then looking on any aerial photographs I could dig up. That proved to be a bit hit and miss. There were clearly some sections of existing path that matched the OS line but also some areas where nothing was obvious. Still, if it could all be done that way there would be no need to get out and walk it! The start of the route was obvious enough, turning off Muirkirk High Street and through a little lane towards some farm buildings. One of these had a warning sign about accessing the poultry units further on. That explained the strange structures I'd spotted on the aerial photographs. I called in to the farmhouse to explain where we'd be going and had a chat about the route I was taking which caused a little surprise as the owner had no idea there was supposed to be a path there. Upon reaching the poultry units we had to navigate around the back of one as it had been plonked down right over the supposed track. From there it became a matter of trying to join up any sheep trods we could find to keep us heading in roughly the right direction. The GPS was a god-send here on the open moor to stop us wandering off too far. Upon reaching a second gateless fence we spotted a bit of path going exactly where we wanted and made directly for it. However, even this petered out far too soon and we were faced with a heathery truckle up to the col for what was, in any case, an excellent viewpoint. The pathless terrain was proving to be very hard work on what was a warm day and the planned turn-around spot was looking very far away but after a short break for food and drink we headed down towards the forest edge, on the lookout for a clearing that would take us through to the forest track. Again, the GPS kept us right and we were able to scramble over another fence and gain access to the forest. While it was wet underfoot, at least we had no midges and after 500 metres or so the forest track appeared and we were able to make better progress. However, this didn't last long as the OS line veered off at a corner through another break. Once again, there was little sign of anyone passing this way and this actually led us to the wettest part of the whole route. Not long after, we spotted the ruins of a building at North Bottom and managed to take a few photos of what must once have been a pretty substantial house. Some quad bike tracks around here suggested that the local farmer had been up tending to his sheep. Still some distance short from our planned end point we decided that we'd had enough for the day and turned up to the forest track to retrace our steps. Before reaching the col we'd had lunch at we headed further up hill towards the summit of Cairn Table. This option had two benefits (a) it was a summit with a likely good viewpoint and (b) I knew there was a substantial path heading back to Muirkirk, thereby avoiding the heather-bashing we'd need on the way up. Despite the need to put in an extra bit of ascent, this was very definitely a good decision with great views over to Arran and Galloway in particular, plus some great cairns on top and an obvious, wide path snaking it's way back down hill. The Co-op in Muirkirk was relieved of some ice creams and cold drinks before we headed back to the car for the drive home. On reflection, it's easy to see why the old track has now all but disappeared. What would once have been a relatively minor route for a few farmers has decayed as those farm buildings have. Meanwhile, "townies" are hitting the summits that would once have held little attraction causing substantial erosion. It's a pattern repeated throughout Scotland.